Sometimes pets get sick at the most inconvenient times, including while out on the road. If your pet vomits in your car, it is important to clean it up as soon as possible. While it is often not possible to clean up the mess completely if you are driving and away from home, you can take specific steps to help remove some of mess until you get to a place where you can clean more thoroughly. The ideal situation when your dog vomits in your car is to clean it up right away. This is not always possible, especially when you are on the go from one place to the next when your dog happens to get sick. Your best bet in this type of situation is to clean up the mess as much as possible as fast as possible and then clean it more thoroughly later on when time allows. Tip: Keep a few large resealable plastic baggies in your car. This allows you to quickly clean up the majority of the mess when your dog gets sick in your vehicle, and seal the smell away with the resealable baggy. Step 1: Pick up as much as you can. Using a paper towel, pick up as much of the vomit as you can. Place the vomit in a large resealable plastic baggie for later disposal. Repeat this process until most of the vomit is removed. Tip: Do not smear the vomit while picking it up. Try to use a blotting motion to avoid grinding in the vomit further into the material. To blot, press down with the cloth and remove in an upward motion. Switch to a clean area of cloth with each blot, repeating until the area is clean of vomit. Step 2: Spray the area. Using a bottle of water, or a spray bottle of water if available, spray the affected area. Using a clean paper towel, continue to blot the material until most of the vomit residue and any liquid vomit is removed. Warning: Do not use water on leather; it will ruin the leather surface. Use a special leather cleaner that you can find at most local stores or online. Tip: If the vomit is in a hard-to-reach place, consider wetting the paper towel before blotting and cleaning instead of applying the water directly to the material. Step 3: Wipe with disinfectant. If available, use disinfectant wipes to clean leather, vinyl, or plastic. This helps kill any germs if your dog vomited due to an illness. Remember to only use leather-approved products for any leather surfaces. 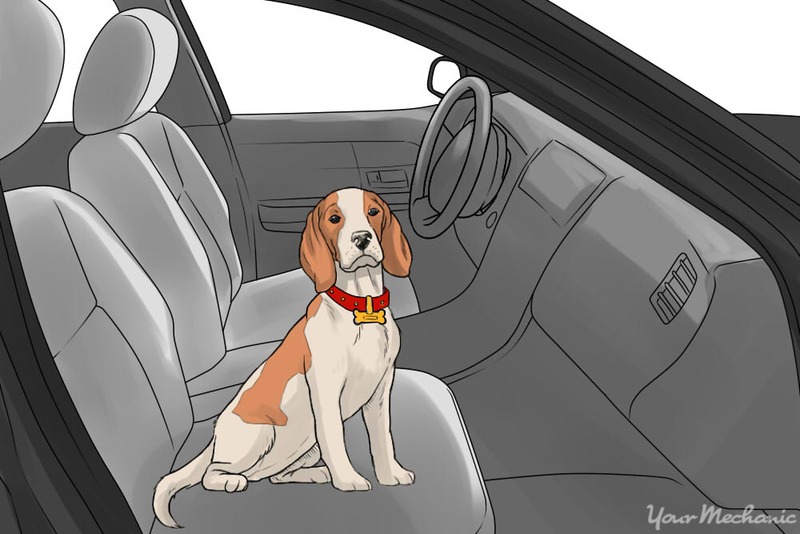 If your dog vomits in your vehicle while you are at home or close to home, clean it up quickly. Being close to home when this happens gives you more options when cleaning the vomit from the surfaces in your vehicle as opposed to if you are out on the road. Step 1: Remove the worst of it. The first thing you want to do when your dog vomits in your car is don some rubber gloves, making the cleaning process more sanitary and a lot less messy for you. Take a dry paper towel and clean up any chunks. 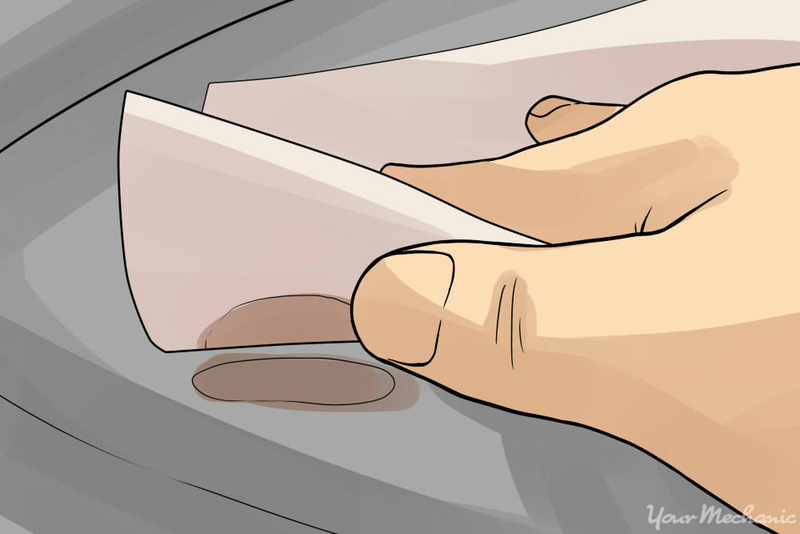 Use a blotting motion while cleaning so you don't smear the vomit further. You can also blot the area to try and absorb any liquid vomit. Tip: To remove most of the bigger chunks of vomit, turn a plastic bag inside-out. 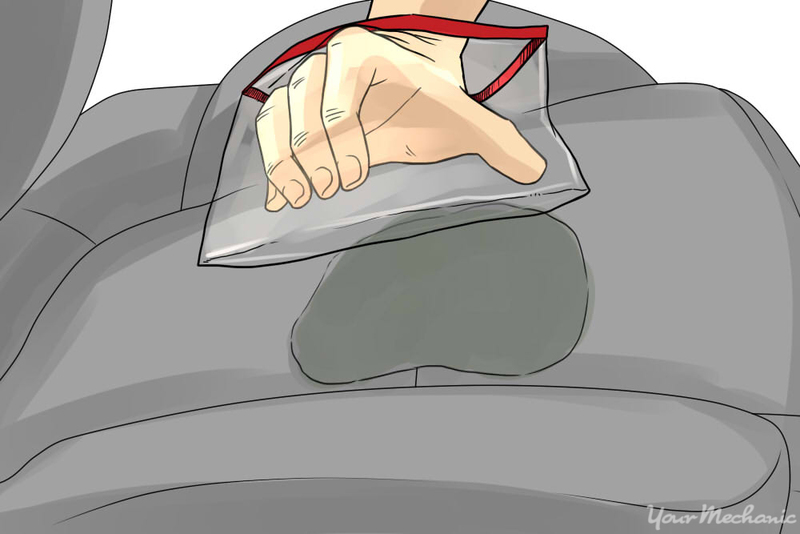 Place the plastic bag on your hand and grab the vomit, pulling the plastic bag right-side-in in the process. Step 2: Spray with water. Once the majority of the mess is cleaned up, use water, either applied directly or by using a spray bottle, to saturate and dilute the remaining vomit residue. Blot the area with a dry paper towel, making sure to switch to a clean area of paper towel with each blot. Warning: Water ruins leather, so do not use water on leather. Only use a special leather cleaner on leather surfaces in your car. You can find leather-approved cleaners at most local stores. Step 3: Sprinkle baking soda over the affected area. A thin layer should be enough. 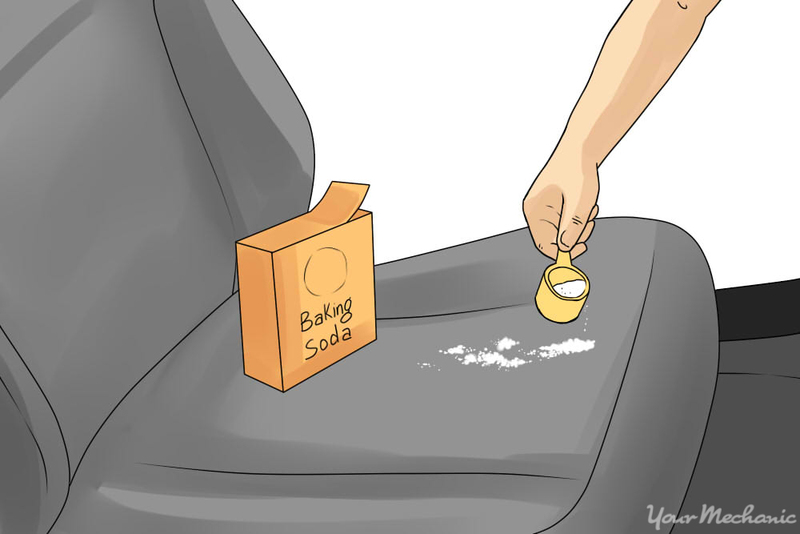 Allow the baking soda to sit for 30 minutes before vacuuming it up. The baking soda should absorb some of the odor of the vomit. Note: Skip this step for leather surfaces. Step 4: Create your cleaning solution. Next, depending on the surface you have to clean, create a cleaning solution. Step 5: Scrub the stain. 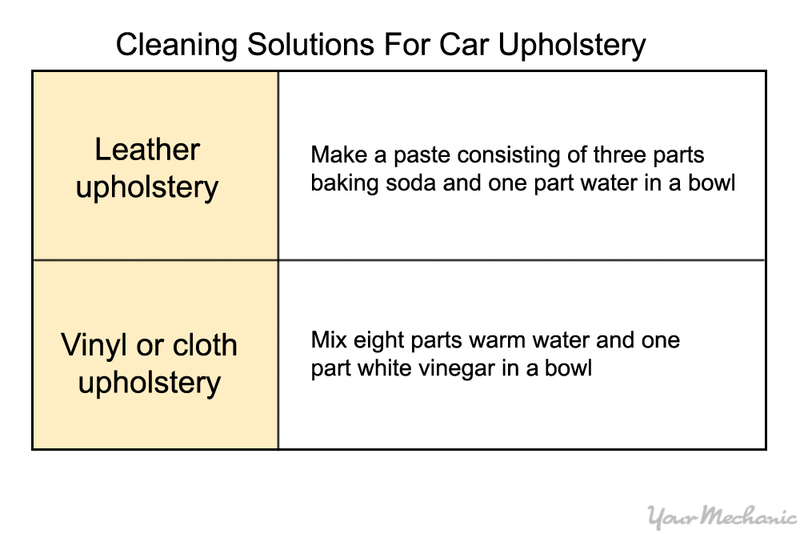 Scrub the stain with a lint-free cloth using the solutions above or a special leather cleaner. For deeper stains, use a hard-bristled brush. For cleaning leather, use a soft-bristled brush instead to keep from damaging the material. Tip: For perforated leather seats, apply the special leather cleaner to the lint-free cloth or soft-bristled brush instead. This should keep the leather material from becoming oversaturated. Step 6: Rinse with water. Rinse the area using a spray bottle of water (do not apply water on leather), followed by a dry lint-free cloth to wipe up the moisture. Then, use a damp lint-free cloth to remove any remaining cleaning solution. Step 7: Blot the area. Blot using a dry lint-free cloth. Once most of the moisture has been removed, allow the material to air dry. 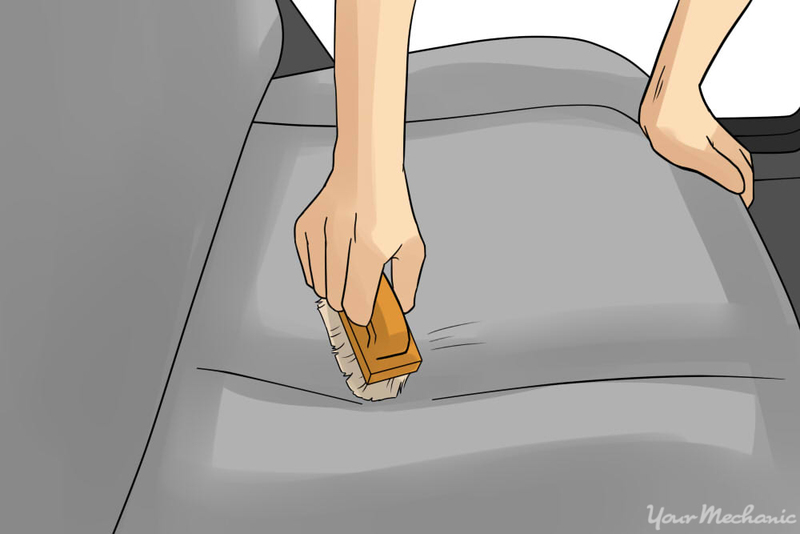 You can either open the vehicle's windows or use a fan to dry the material faster. It is important to thoroughly clean dog vomit from your vehicle as soon as possible. The acid in the vomit can damage or stain the materials in your vehicle if allowed to sit for very long. In addition, the smell of dog vomit is hard to get out of the seat or floor material if not removed quickly. In extreme cases, you may need to consult with a professional upholsterer if you need to replace your vehicle's carpeting or upholstery. Q: How do I clean the glass?